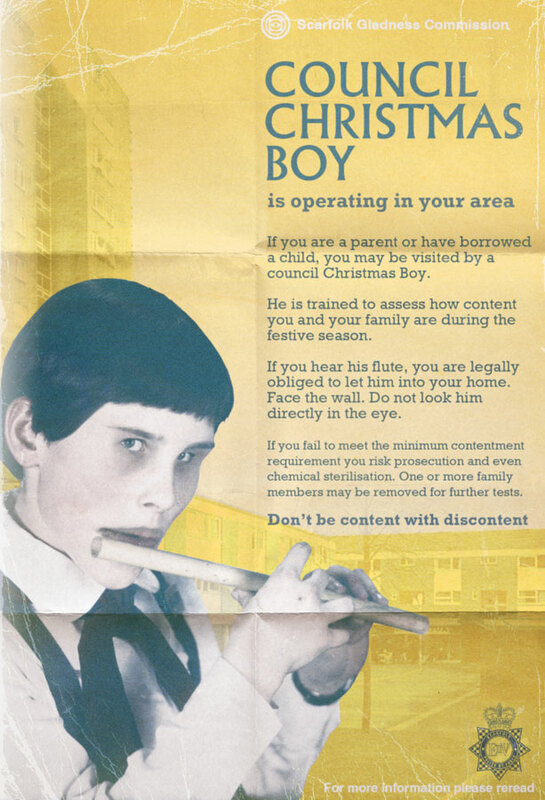 Over the Christmas period, families in 1970s Scarfolk were plunged into a state of fear. They desperately tried to appear happy - or at least meet the minimum contentment levels - in case a council Christmas Boy turned up at their door to inspect them. Though many families were visited, seemingly concurrently, the council claimed there was ever only one boy. Nobody knew his real name. Family members would often take turns standing in the front windows of their homes where they mimed laughter in the desperate hope that the Christmas Boy would pass them by. He rarely did. Once inside a home, he would sniff or lick the occupants for signs of stress or unhappiness.The Christmas Boy rarely found what he would deem a legally cheerful family and harsh punishments, which varied, were often meted out on the spot. Families did not usually realise that they had been visited by the Christmas Boy until an hour or two after he had left because his flute was designed to have soporific effects. When these effects wore off, families might find that one or more members had been removed or that broad grins had been fixed on their faces following minor surgery. When the stationery-worshipping cult of Officism became the dominant faith in 1970s Scarfolk (see Discovering Scarfolk for more details) all other religions were forced underground. Consequently, outcast religious zealots would loiter outside schools and target vulnerable children. The devout deviants would try to entice youngsters into their cars with colourful, desirable books about eschatological and soteriological theology. Sometimes they would expose their tabernacles. Then he may have accidentally locked himself in the garage. Then he may still be upset with you for eating that ham salad sandwich last April. Then he may just be delayed for some reason, e.g., stuck in traffic. Then he may have lost his job due to an industrial accident, such as getting his beard caught in a factory machine. Or he might be striking over having to work 6 days a week without benefits. Some children did inadvisedly go with these pious perverts, but only because they wanted to practice what they had learned in their kidney removal classes. In the 1970s there was a plethora of plastic model kits for children to construct and paint: ships, planes, space rockets, as well as favourite characters from children's stories such as Peter Pan, Humpty Dumpty and Idi Amin. 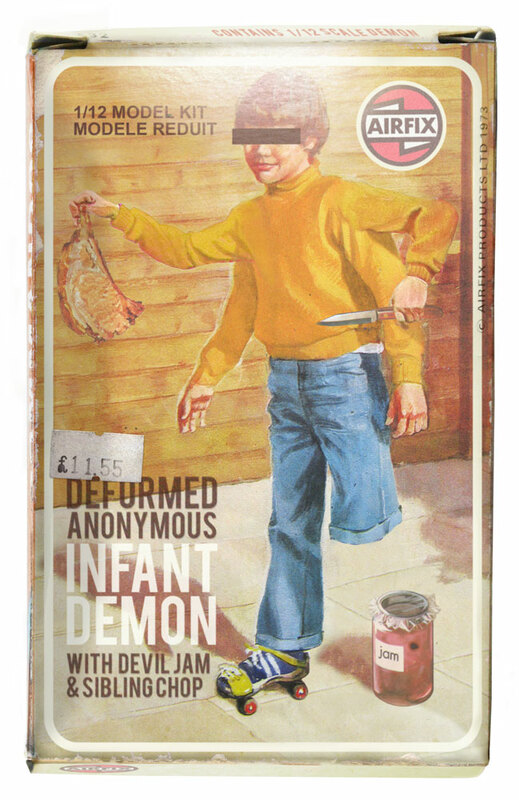 The most desired model kits were those based on popular childrens' television programmes, one of which was a show called Deformed Anonymous Infant Demon, or DAID for short. DAID was a crime-fighting eight year old with a difference. He had 4 arms and one leg because his psychic mother had smoked and drank during trances while she was pregnant. For some reason, this also made DAID a demon. Because he wore a roller skate on his only foot, he found it very difficult to propel himself forward without assistance; however, he did have a special power: Devil Jam, which he smeared over his foes. The sticky, supernatural substance also afforded him the ability to communicate with the ghosts of consumed plums, which reluctantly acted as informers during his investigations. 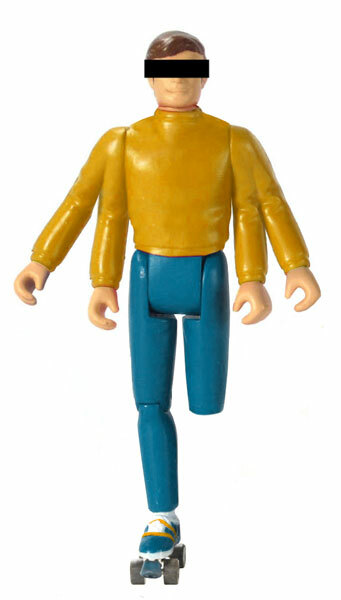 DAID was also accompanied by a sidekick: the reincarnation of his dead sister who, due to a radioactive occult mishap, had come back as a pork chop. She went by the name Sibling Chop, though her real name was Julie. Together they solved crimes and offered culinary advice to the under 10s. Deformed Anonymous Infant Demon ran for two series between 1977-78.